With the right size for drivers who need an agile and functional vehicle, the new 2012 Toyota Yaris Hatchback arrives with sporty styling, class-leading safety features and improved fuel economy. The all-new Yaris features a remarkable attention to detail in the design and engineering of the vehicle. From its smart, interior design and quiet, refined passenger cabin to its responsive driving dynamics, the 2012 Yaris Hatchback answers car-shoppers’ demands for a no-compromise vehicle. The hatchback body styles dominate the subcompact vehicle segment in Canada. 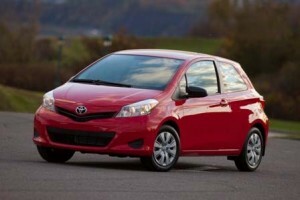 The new Yaris Hatchback has been completely redesigned for 2012, featuring a sportier, aggressive look. The wheelbase has been lengthened to 2,510 mm (98.8 in. ), with the overall length of the vehicle growing to 3,900 mm (153.5 in.). The height of the new Yaris is also reduced by 15.2 mm (0.6 in.) for a stance that is both lower and longer. The result is more cargo room along with additional headroom and passenger volume, all within a highly aerodynamic body yielding a 0.29 coefficient of drag. The 2012 Yaris is equally at home navigating through city traffic, heading to the mall or hitting the highway for a road trip. With a tight turning circle and quick, responsive steering, the new Yaris is easy to manoeuvre on crowded streets and parks in tight spots. The new Yaris will be offered in three grades, with the entry-level CE and value-packaged LE editions available either as a three-door liftback or five-door hatchback. The sport-tuned SE is available only as a five-door. Standard equipment levels have been improved across all grades while simplifying options to make it easier for customers to find the car they want at an affordable price. The new 2012 Yaris was designed for fun and functionality. Both three-door and five-door models are powered by a 1.5-litre, 16-valve, four-cylinder DOHC engine equipped with variable valve timing with intelligence (VVT-i), producing 106 hp at 6,000 rpm and 103 lb.-ft. of torque at 4,200 rpm. The broad torque curve provides plenty of response for both manual transmission and automatic transmission vehicles. All Yaris CE, LE and SE models are available with a new four-speed electronically controlled automatic transmission, featuring a more compact, lighter-weight design and reduced friction for greater fuel efficiency. A smooth-shifting five-speed manual transmission is standard on all models. For the all-new Yaris, both the front MacPherson-strut and rear torsion-beam suspension have been tuned to deliver a better ride and improved driving feel. The front stabilizer bar has been increased to 24.2 mm (0.95 in.). Standard tire sizes are increased as well to 15-inch on CE and LE versions, and 16-inch on the SE. Electric power steering provides good road feel at highway speeds while aiding low-speed parking manoeuvres. Starting with nine standard airbags, the all-new Yaris offers an impressive array of safety features. Standard driver and front-passenger dual-stage airbags (SRS) are complemented by front-seat mounted side airbags and a knee airbag for the driver. Roll-sensing side airbags are fitted on front seats and there are two front seat cushion airbags for a total of nine standard airbags. In addition to its many safety features, all Yaris models are well equipped with popular comfort, convenience and technology features. Starting with the Yaris CE, all models include standard electric power steering, power-assisted ventilated front disc brakes, power door locks and Cold Weather Package. Other standard features include six cup and bottle holders, and storage cover for the cargo area, Halogen headlamps, intermittent front windshield wiper and a rear window wiper. All models also feature full audio connectivity via USB and auxiliary ports, along with a standard AM/FM/CD player with MP3 and WMA playback compatibility. CE and LE models feature an audio system with HD radio, four speakers and Bluetooth music streaming technology and the SE features six speakers and Bluetooth music streaming technology. The bold new design of the 2012 Yaris is longer and lower, with a longer wheelbase. Its assertive presence is visible from all angles, starting with the distinctive protruding front profile with wide headlamps and integrated turn signals. The side profile displays a steeply sloped beltline, and flowing curves that appear to stretch the image of the vehicle. The shoulder lines continue around to the rear, creating a sharp, solid look. Eight colors are available for the new Yaris, including Alpine White, Classic Silver Metallic, Magnetic Gray Metallic, Black Sand Pearl, Absolutely Red, Lagoon Blue Mica, Wave Line Pearl and Blazing Blue Metallic. The interior has been completely redesigned on the new Yaris, providing a level of detail not often seen on cars in this price class. The doors close with a smooth, solid feel. Additional sound-absorbing and insulating materials make for a quieter ride. Upgraded fabrics and soft-touch dash highlight a more premium, sporty interior. The front seats are now wider, and sculpted to reduce fatigue on long trips. The driver experience is heightened with a new tilt three-spoke steering wheel, featuring a thicker grip and a flat-bottom shape to reduce knee interference. The instrument cluster, center-mounted in the previous Yaris, is relocated in front of the driver and includes a multi-instrument display with odometer, twin trip meters, clock, outside temperature reading, fuel economy display, average speed and Eco-Driving indicator (Automatic transmission only). CE, LE and SE editions include a 60/40 split fold-down rear seat. The luggage compartment area has been lengthened by 144.8 mm (5.7 in. ), and widened by 53.3 mm (2.1 in. ), to increase cargo volume by 64 percent in the 3-door and 68 percent in the 5-door. Cargo capacity with the seat up is 433 L (15.3 cu. ft.) on the 3-door and 442 L (15.6 cu. ft.) on the 5-door. The Yaris SE provides even more driving fun with its sport-tuned suspension, quicker ratio steering, standout styling and driver-oriented interior. The SE features both front and rear disc brakes, with the front disc nearly an inch larger in diameter than L and LE versions. The SE is equipped with P195/50R16 tires and alloy wheels. The SE makes a distinctive statement with smoke-trim multi-reflector halogen headlamps, integrated fog lamps and color-keyed grille with sport mesh insert. It features color-keyed front and rear underbody spoilers, rear spoiler and rear diffuser, set off by a chrome exhaust tip and SE badge. The 2012 Yaris Hatchback comes with a starting MSRP of $13,990.